1. What makes your foam so good for tool control? 2. How do you ship sheets of foam? 3. How do I stick the two layers of foam together for "shadowing"? 6. Why can't I place my order online? 7. I don't see my question listed here! How can I contact you? Our standard foam is closed-cell polyethylene. It does not react to Skydrol or other caustic solvents or chemicals. To guarantee the highest quality product, our standard foam is 6 pounds/cubic foot density, which makes it easy to cut yourself, unlike lighter weight foams that can tear and have a ragged appearance when cut by hand. If you order less than 10 sheets, we roll the foam and ship by FedEx or UPS. Since you pay the freight, you can dictate how you want them shipped, i.e., Next Day, Standard Ground, etc. Orders over 10 sheets are shipped FLAT on pallets by LTL (truck). When shipped flat, the foam arrives ready-to-use. Rolled foam should be laid flat for 24-48 hours to allow it to relax before use. 3. How do I stick the two layers of foam together for tool "shadowing"? 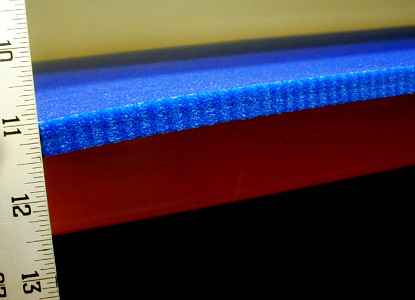 Bonding two pieces of our standard 6-lb foam is easy to do using a common heat gun. Complete instructions come with the foam sheets and can be found here. If you order sheets with PSA (pressure-sensitive adhesive) applied, it is easy as "peel and stick". Complete instructions come with the foam sheets and can be found here. There is a 10 sheet minimum order for PSA applied foam. On small jobs, it can take as little as 5 minutes. On larger, more complicated projects, please allow a day or two. We accept credit card payments by VISA, MasterCard, and American Express. We also accept purchase orders. To be sure you are ordering what you actually need we have qualified staff available to answer your questions in person. Call between 8-3 PST and we will be glad to take your order. It is easier to make sure you get exactly what you are expecting if you talk to a "live person" who can point you to the right material and possibly offer money-saving ideas. We can also help you determine the best and most cost-effective shipping method for your order. Send us an e-mail: sales@toolfoam.com or complete our Quote Form, and we'll be happy to help you. Please remember that we are on the West Coast of the United States, so we may not be in your time zone. However, we'll answer your question as soon as possible in our business day.